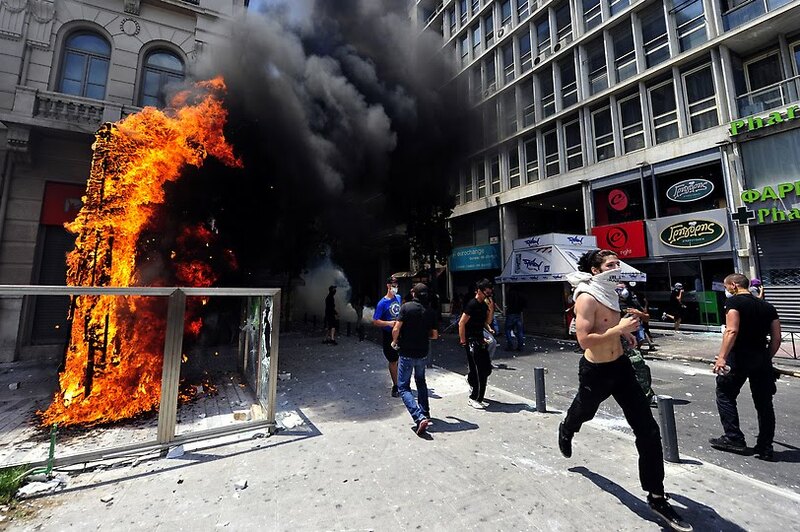 THE MOOD of resistance of the Greek people is hardening, after 'austerity' laws were imposed and brutal police violence unleashed against them. Thursday night's people's assembly in Syntagma Square was one of the biggest ever, reports From The Greek Streets. Says the blog: "The waves after waves of police violence during the General Strike of June 28-29 deterred no-one. "Once again, thousands took to the streets and gathered in Syntagma to protest against the memorandum, the troika, the government but also, this time, the police. "The change in the atmosphere was quite stunning, with anti-police slogans chanting through the air. The rage of the previous days was there, but the fear was gone." PEOPLE in Greece are saying 'no' to the insidious neoliberal 'austerity' measures being imposed on them via their corrupt parliament. On Tuesday, as the 48-hour national strike began, fierce battles broke out on the streets of Athens as police once again demonstrated the limits to 'democracy' in a capitalist state. 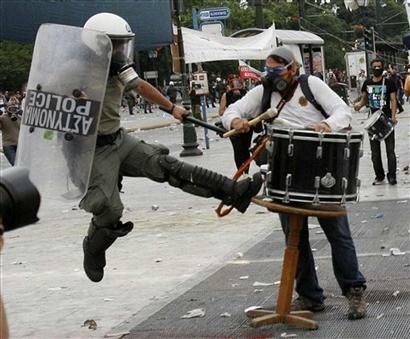 Stun grenades and tear gas were used in huge amounts as thuggish riot cops repeatedly tried to clear Syntagma Square. Clashes went on late into the night. Wednesday, when politicians are expected to vote through the measures despite massive opposition from the population, is likely to see even more dramatic clashes. Updates are being posted on From the Greek Streets. Live streaming from Syntagma can be seen here. 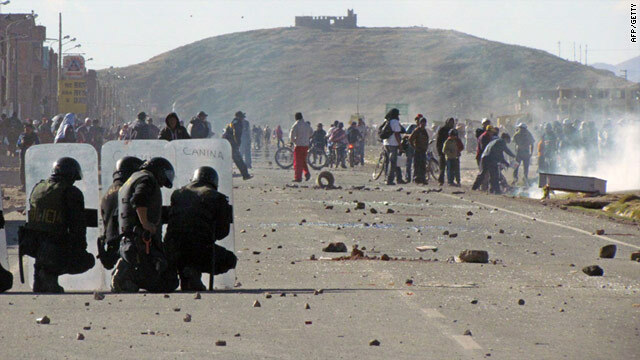 PROTESTERS in Peru have scored an astonishing victory against the destructive forces of global capitalism. Reports the Globe and Mail: "As smoke rose from burning tires and torched security vehicles, heavily armed police confronted nearly a thousand angry anti-mining protesters walking the runaway of Juliaca’s airport in southern Peru, near Lake Titicaca. "One protest leader called for the group to reclaim the airport. Others said it was too dangerous. Then a call came through from the protest leaders in the capital, Lima. "The government had given into their demands and agreed to revoke the licence for Canadian mining firm Bear Creek to open its Santa Ana silver mine in the area; as well, it halted all new mining concessions in Puno province for 36 months. "The unrest ended with the agreement Saturday, narrowly averting a repeat of a bloody conflict the day before, when police killed at least five demonstrators at the airport. "While the breakthrough agreement stopped further bloodshed, it casts doubts on other resource operations in Peru, a nation that relies heavily on foreign investment and receives about 70 per cent of its GDP from the mining industry. "Peru is South America’s fastest-growing economy, driven by surging commodity prices, but the rural poor have benefited little from mining and complain it contaminates their water and crops. "The incoming government must balance the interests of international resource firms, whose production is a huge source of national wealth, alongside those of protesters who argue mines have a devastating impact on the environment." Hackers accused of inciting "cyber riot"
A NEW front in the global insurrection has evidently been established, with hackers now being accused of inciting "cyber riot". Channel 4 was reporting on claims that the 2011 UK Census, collected by major war profiteers Lockeed Martin, had already been hacked. This coincided with the arrest of a 19 year old man in England - who insiders deny was part of the LulzSec hacker group allegedly behind the apparent coup. Says the report: "A cyber-threat expert at a major UK financial institution has spoken to Channel 4 News about what he sees as a 'step change' in activity by LulzSec. "Authorities in Britain and the US have been trying to trace them for several weeks following apparent attacks on the CIA, the US Senate, Nintendo, Sony, the X-Factor and US television networks PBS and Fox. In the UK the group has also claimed to have found security flaws in systems at the NHS. "The intelligence officer, who works to protect his organisation and wished to remain anonymous, said: 'Their aim is to expose 'laughable' security at big organisations. They are quite simple cyber attacks. But they appear to have got bored and moved on. "'They went from targeting individual organisations to large initiatives - under the banner of the #AntiSec operation. That is a step change... it seems like the buzz [of the first alleged breaches] had worn off and they have thought 'can we incite a cyber-riot?'" 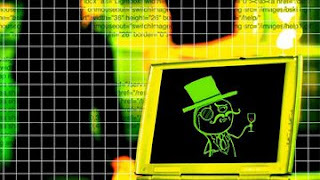 "He added: 'This kind of threat is definitely here to stay and whilst arrests will have an impact on LulzSec, hacktivism is here to stay'." SOCIAL order is crumbling in Greece, with the state no longer able to manage its population. 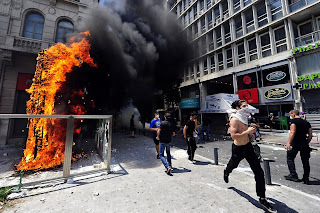 That is the conclusion of the From the Greek Streets blog following dramatic events on Wednesday, in which a gneral strike and attempts to block the parliament ended in chaotic scenes of tear gas and police violence. The significance of events for the whole neoliberal global system was reflected in corporate media reports focusing on the financial implications. Wrote The Guardian: "The escalation of the Greek crisis had instant European and global impact, sending world stocks tumbling and exposing European Union paralysis over whether and how to launch a second attempt in a year to save Greece from insolvency." Syntagma, Athens, June 15th 2011. How to put to words what we lived in this square, over the course of a single day? A society in some spectacular turmoil; the most unusual of suspects have now taken to the streets. Syntagma was meant to be the epicentre of today’s attempt to block off Parliament as called by the square’s popular assembly. It was also the main focus point of the General Strike. At times, it felt like worlds in collusion: the naivety of pacificism, the fetischisation of anti-police violence. And around this collusion, a myriad others… In Syntagma today we fought off the Neo-nazis of the Golden Dawn, who had the nerve to show up at a General Strike. We saw the demonstrators’ clashing with police in the square’s South-eastern corner (for an unjustifiably long time) being followed by an astonishing, but only momentary, sweeping clean of the thousands on its square. People were trampled over tents, gassed like ants, fainting all over. By the time that the Delta motorcycle police tried to come into play, people had learnt the rules of the game — and they pushed them off. Twelve hours of nearly uninterrupted beating, tear-gassing, running, fighting. For these twelve hours, Syntagma compressed and showed naked the haphazard patterns into which people’s actions are cornered by this social order. A social order that is crumbling, an authority at loss, unable to manage its populace any longer. A regime that has fallen a while ago, only resting on the fallacy of some imagined national unity to try engineer change, to lengthen its days. How can we possibly buy this? The hundreds of thousands who were out in Athens today already know: Syntagma was a storm; we are just waiting for the thunder. 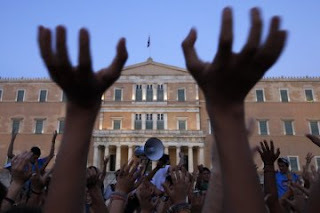 WEDNESDAY June 15 is shaping up to be a crucial day in the history of Greece - and perhaps in the history of the struggle against the neoliberal global system. Buoyed by last weekend's turnout of 100,000 people in Athens city centre, the real democracy movement is calling for a massive blockade of the parliament on the day of the general strike and the vcote on the new "austerity" measures. Last night (June 11th) the popular assembly of Syntagma square announced a call to blockade the Greek parliament ahead of the voting of the so-called Mid-term agreement between the Greek government and the troika (IMF/ECB/EU). The new agreement includes wild tax increases, the further slashing of wages and pensions and the lay-off of approximately more 100,000 civil servants in the next few years. The call-out for the blockade below is one of the most important acts we have seen by the Syntagma assembly so far. June 15th is gearing up to become a historical day in Greece, a crucial chance to block off the charge-ahead of neoliberalism here. Don’t be a spectator to this – translate and disseminate the text below; organise a gathering where you are, or come join us at Syntagma. This is the struggle for and of our lives. 24 hours in the streets! Now that the government is trying to vote in the mid-term agreement, we encircle Parliament, we gather and we stay at Syntagma. All together, we continue and strengthen the mobilisations that began on May 25th. Our first stop is the General Strike of June 15th. We won’t stop until they withdraw it. Until June 15th we will be going all over Athens to make sure that the call of the Popular Assembly of Syntagma is spread everywhere. We give a meeting of struggle for the day of the voting in of the Mid-term agreement. PROTESTERS in Wisconsin, USA, have set up a tent city inspired by the Spanish and Greek revolts. Reports The Huffington Post: "In February and March, thousands of protesters flooded the Wisconsin Capitol, sleeping in the building overnight and filling the dome with their chants to bring attention to Gov. Scott Walker's attempt to strip public employees of their collective bargaining rights. "Now, some of those same individuals are taking the fight to the grounds around the Capitol, erecting a tent city to pay witness to the legislature's budget negotiations." Peter Rickman, a University of Wisconsin-Madison law student and Teaching Assistants' Association member who is helping to organize the event was quoted as saying: "It is a galvanizing, symbolic action of working folks standing up and saying enough is enough." Rickman told The Huffington Post there were around 100 tents set up Saturday night around the Capitol in downtown Madison. The tent city is being called "Walkerville," reminiscent of the "Hooverville" shanty towns set up by homeless Americans during the Great Depression. Organizers have a permit to stay there until June 20. The intent, however, is to remain as long as as the budget negotiations are going on inside the Capitol. Each day will highlight a particular group of individuals organizers argue will be most affected by cuts in the budget. Sunday is about K-12 education; Monday will focus on public services; and Tuesday will be about health care. So on Sunday night, for example, there will be a public forum about the cuts in the budget to education, and on Monday, organizers are expecting a heavy turnout from sanitation workers, firefighters and other public employees. 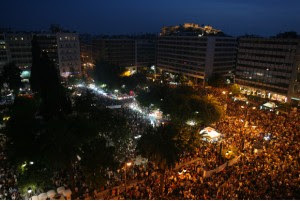 A MASSIVE crowd of 100,000 or more gathered in the centre of Athens on Sunday night as the Greek crisis intensifies and the June 15 general strike approaches. Reports From the Greek Streets: "A crowd whose size is difficult to even estimate gathered in central Athens to protest against the crisis and the Memorandum tonight. "The call to a pan-european call of action saw more than 100,000 (some estimates give much higher numbers) flooding Syntagma square and many central nearby avenues. "In contrast to previous gatherings, police presence was much higher, with fencing erected around the parliament building and double, or triple rows of riot police around it. "The city is now building up for the General Strike of June 15th, which is also the next date of action announced at Syntagma square. "Both mobilisations are aimed against the new agreement between the government and the troika (IMF/EU/ECB) which is planned to be voted at parliament on the morning of the 15th. "The general assembly of Syntagma square has already called for a blocking of the parliament from the night of the 14th. In addition to the fencing installed around the parliament, a police water cannon has also appeared nearby. 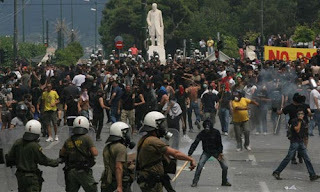 "Similar demonstrations took place in Thessaloniki, Patras, Heraklion, Larisa, Volos and many other Greek cities. In the Cretan city of Chania, fascists bearing arms appeared in the gathering, in a failed attempt to provoke the gathered crowd." SCENES of mass jubilation have broken out in Yemen after President Ali Abdullah Saleh fled the country. Officially, the pro-American dictator is in Saudi Arabia for medical treatment following a near-successful attempt on his life. But the mood on the street is that phase one of the revolution has been completed and the country has followed in the footsteps of Tunisia and Egypt. Reuters quoted one Egyptian revolutionary as saying: "This signifies the fall of the third Arab authoritarian regime and will give a massive boost to those fighting in Syria and Libya." Egyptian political scientist Hassan Nafaa added: "The 'Arab Spring' will continue, Arab people are in a state of total rejection of their current ruling systems." POLICE used water cannon to attack protesters, as 25,000 students marched in Chile against the neoliberal grip on the education system. The massive and angry demonstration in Santiago focusd on privatisation and the massive debts incurred by young people to pay for their studies - familiar themes across the capitalist world. When taking into consideration the average family income in Chile, university fees are nearly three times higher than the United States, Japan, and Australia, reports Al Jazeera.